Great stains set with 5 washable colors in yellow, red, green, brown and white. Stamps, scooters,..
Dido Dough is natural, non-toxic, long lasting and safe play dough. It is made from food grade ingre..
Hasbro – Play Doh Pet Mini Tools, Branch It’s time to get creative! These pets are ready to roll in..
5 fun Play-Doh tools shaped like dinosaurs Grow silly spikes for the triceratops Slice and cu..
-No Thumbs Challenge -Perform different challenges to earn cards -Draw it, Sculpt it, and Do it ch.. Extra light clay, childhood friendly not sticky to hands Stretchable Imag..
No matter how you slice it, it's way too much fun to see what kinds of silly sandwiches and other cr.. Dive into creative fun with Wavy the Whale! To start the sea silliness, simply equip Wavy ..
-High quality toys for children all ages -Made using safe materials -Tested for qua.. 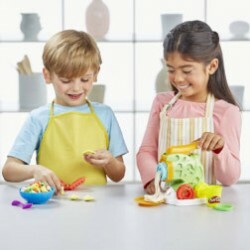 Create all kinds of Play-Doh frozen desserts Imaginary ice pops, silly ice cream sandwiches, an..
Over 20 grocery-themed Play-Doh tools for creative chefs Shape imaginary eggs with the egg cart..
Grow giggly, wiggly Play-Doh legs for cranky the octopus Treasure chest and clamshell reveal mo.. Junior bakers can get creative with their own pretend mixer Press to spin and stamp Play-Doh co..
Now there is the popular Play-Doh putty in advantageous single doses. From the different colors you ..
See Play-Doh foods "bake" in the electronic Magical Oven Load pretend food and Play-Doh compoun..
Made for squeezing, squishing, and pressing, this classic toy is still a fun arts and crafts activit..
All the right tools to become a Play-Doh cake chef Create pretend cakes with the cake molds and..
Have a Play-Doh breakfast bonanza with colorful pretend foods Waffle maker also creates pretend.. This set of Crea Dough 5 Basic Colours contains soft dough that can be used alone or alongside other..
Help your child explore pre-reading and pre-writing skills with Play-Doh fun Together Time Guid.. Play dentist with this Play-Doh Drill ‘n’ Fill set. Start the patient's appointment by shaping some ..